Along with trying to get out of debt, I’m also trying to dispose of clutter in my life and in my house. I really believe clutter and debt go hand in hand, after all both can be caused by excessive shopping for things you don’t really need. I’ve been on my journey to get rid of clutter and debt for just over a year now and in that time, I’ve tried a few different ways to get rid of my clutter with varying degrees of success. Here are three ways I’ve successfully freed up some space in my house. Putting things in the trash is the easiest way to get rid of them – plain and simple. It takes almost no effort to open the trashcan or dumpster and put things inside it. But I hate trashing things that could be of value to someone else, so I rarely trash my clutter unless it’s something broken, used up, or actually just trash. I have an almost permanent spot in my house where the “donate box” lives. As I identify clutter that I want to dispose of that isn’t worthy of being sold online but isn’t trash, I put it in my donate box. Then once the box is full, I put it in my trunk and take to it to the second hand store the next time I’m out and about. Donating your clutter is one of the easiest ways to get rid of it, but many people have trouble donating things they spent a pretty penny on. 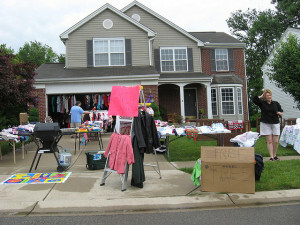 There are several ways you can sell your clutter, including having a garage or yard sale and posting things online. Having a garage or yard sale to get rid of clutter is actually a lot of work. You have to designate an area to collect your sale items, sort them, price them, haul them to the yard or garage, organize them, etc. I have had several garage sales in the past with varying success. The last one I had made just over $600, so I will definitely be having another one in the future even though I don’t really enjoy them at all. Selling things online can also be a hassle. If you go the Ebay route, it’s really only worth the time invested to sell pricier items. It takes quite a bit of research and time to sell things on Ebay and make any kind of “profit” back. If you decide to sell your clutter via Craigslist or your local Facebook Buy/Sell/Trade group, be prepared to be annoyed. My area is too rural for Craigslist to work well for me, but I’ve heard good things about it from friends who live in more urban areas. I’ve actually had a lot of success with selling things on Facebook. But with selling on Facebook comes the hassle of trying to set up meeting times with prospective buyers and hoping they show up on time. I’m pretty busy, so for me this is the biggest hassle and turn-off for trying to sell my clutter on Facebook. How do you dispose of your clutter? What’s one thing you always seem to collect but never really seem to use. What tricks do you have to sell your stuff that doesn’t take a whole lot of time. Do you think debt and clutter go hand in hand? Aaahh, this is one topic I can totally relate to. I seem to be buying more and more stuff but disposing off less and less. I understand! That was me in 2013 and prior. Now that I’m on a journey to improve my finances I’ve realized how much minimalism and decluttering have to do with finances too. I take things one piece at a time. For most stuff in decent condition, it gets donated. For other things, I sell it using a combination of Craigslist/eBay. Then there is the little stuff that I am certain no one wants, which just goes right into the garbage. I have been on the declutter mission for longer than I care to think about. It is paying off and I plan on accomplishing even more during this year. We do not sell our items, we donate to a thrift shop that helps fund a no-kill shelter in our small town. 😀 Neither one of us want to deal with the hassle of selling things and this works for us. Of course what isn’t suitable for re-sale is tossed. Such a great bonus for us because we have more room and we can find what we are looking for much easier. Keep it us. PS Yes I think often clutter and debt go hand in hand. It’s great that you can support such an awesome cause with your donations! I wish there were more choices here for places/causes to donate to. That is one thing that holds me back from donating more of my stuff. The places here turn around and sell stuff to make a profit as a business, not for a cause. I can remember to throw away or donate items, but it’s the third point that I always forget. Lame, huh? Thanks for the reminder! We actually spent all day on Saturday in our home getting rid of clutter and most of it ended up in a trash bag headed for trash. The rest we are planning to give away since it’s mostly clothes. It felt great, though, to process the clutter because now I feel like I have a clear house and a clear mind headed into the new year. Great job! I spent several hours yesterday going thru my linen/medicine cabinet in my master bathroom. I rearranged and got rid of a few things too. When I was finished, I ended up with 1.5 empty shelves, which I’m excited about! Sell that stuff! We made a bunch of extra cash while cleaning/purging before the arrival of our daughter. My wife and I made enough to cover the cost of the crib/dresser for the babies room. I made just over $600 last year at my garage sale from mostly small items, so I know what you mean about the benefits of selling your clutter. I’m planning to do another garage sale again this year as I already have a pile of stuff ready for it! I don’t like having garage sales. I’m always worried about someone pulling a gun on me and robbing me. At my last garage sale, a family stole from me. The woman had asked the price and then declined to buy it. Later, I saw one of her family membesr carrying it across the street to her car. I confronted them and got it back, but it was pretty upsetting. That was 30 years ago, and I’ve never forgotten it. Now, I just donate my items. Oh wow! I live in a pretty safe neighborhood in a small, rural community where everyone knows everyone else so I’ve never worried about anything like this. Yikes! I totally agree that clutter and debt go hand-in-hand! I’ve been giving away more than selling lately, simply because it’s easier, and it’s nice knowing I’m benefiting someone else without any cost to them. Plus, as you mentioned, garage sales in rural areas aren’t usually real successful. Great post, Kayla! Thanks Laurie! I’m glad you like the post 🙂 I do give away quite a bit too because it is much easier (and quicker) than selling things. Garage sale sounds fun!I am planning to up one this February, this will be my first time to do it. I have so many things that I can sell. Before, I just donated it to an orphanage. This time it will be different because The money I will get from this sale will also be donated to an orphanage. I am so excited! That’s a great thing to do with your garage sale money! I plan to put mine toward debt, but if I were in a different financial position (without high interest debt) I’d be willing to donate my garage sale money too. I *really* need to get better at this. Clutter drives me nuts. I can’t think with so much visual distraction around but, I’m caught between a rock and a hard place. I run an online retail biz from home, plus my daughter’s just moved back in after living on campus for 18 months AND, it’s a small cottage! Aaarrgghhh… Definitely time for a serious purge and reorganise. I’d love to sell off some clutter but I’ve been hearing some horror stories about eBay so I’m not sure that’s going to be an option for me. I might check out some other options, though. I can’t work in a cluttered environment either, so I had to do a major overhaul of my home office so I could work in there in peace. I don’t work from home full-time, but I do earn quite a bit from my side hustles at home each month, therefore it was imperative that I get my work environment decluttered. I don’t do much selling on Ebay, I use local Facebook Buy/Sell/Trade groups a lot more and Craigslist.